The client is an investment banking firm, regulated and authorized by the Financial Services Authority and a member of NYSE Euronext. They are in the business of corporate financial advisory services such as fundraising, mergers and acquisitions and management buy-outs. The client was using the Salesforce CRM Application to maintain their Lead and Contact database, and using the mass emailing feature to contact their prospects. Salesforce’s out of the box features have various limitations, which resulted in a lot of duplicate data and difficulty in tracking which prospect had been part of what campaign. In addition to this, the client also faced issues that affected visibility and access control, and needed to implement UI changes for more a intuitive interface, as well as data model changes to support their reporting requirements. 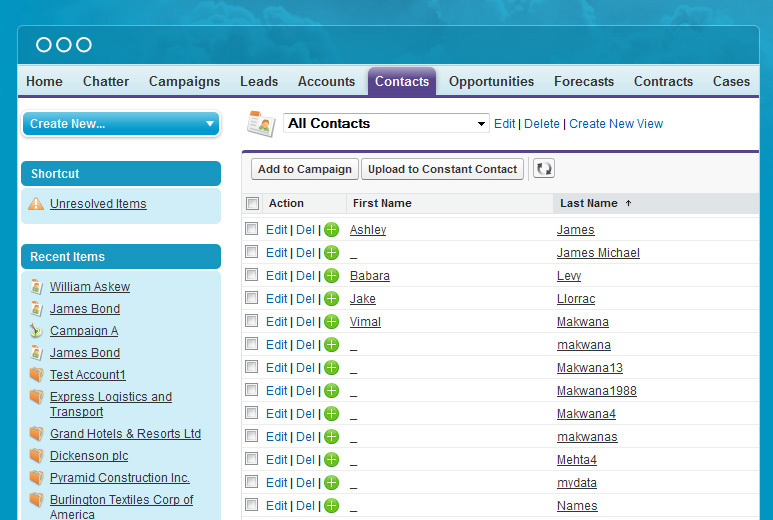 The client chose AllianceTek after we built a demo for them with the UX changes and advanced reporting capabilities. Looking into their immediate requirements, AllianceTek built a custom Agenda application that allows users to schedule conference calls and physical appointments for their prospects. De-duplication of data required data processing, backups and running scripts on their application that would clean data without any loss of related records. The client was extremely satisfied with this approach, as it not only reduced their storage requirements but made their communication from Salesforce more professional. 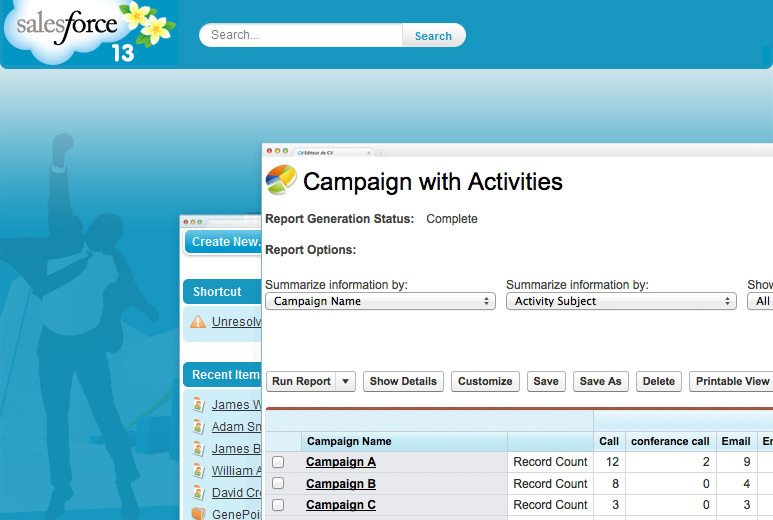 Their data reporting requirements were met using the summary and matrix reports in Salesforce, which allow management to view information such as number of emails sent by each user, number of conference calls generated due to each campaign, number of appointments after each conference call, and number of positive responses to a campaign. In addition, the company CEO needed to view these reports without having to log into the application. At the end of the project delivery, the client was extremely happy to be receiving the highest possible ROI from its Salesforce Application. 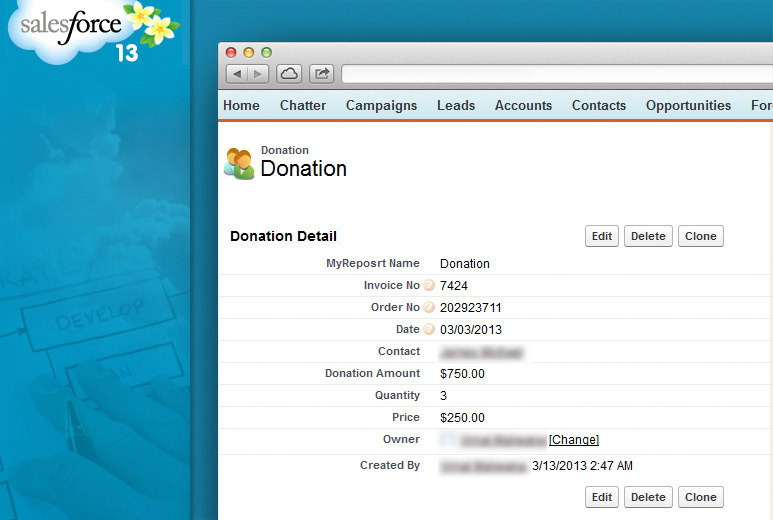 Salesforce became their system of record for their prospect and customer database. Users now had insight into whether a prospect had been contacted, and senior management could analyze the likeliness of a prospect closing on a deal as well. Comprehensive, easy-to-view reports and dashboards enabled the CEO to achieve dynamic views of sales and marketing efforts without being required to log into the application.